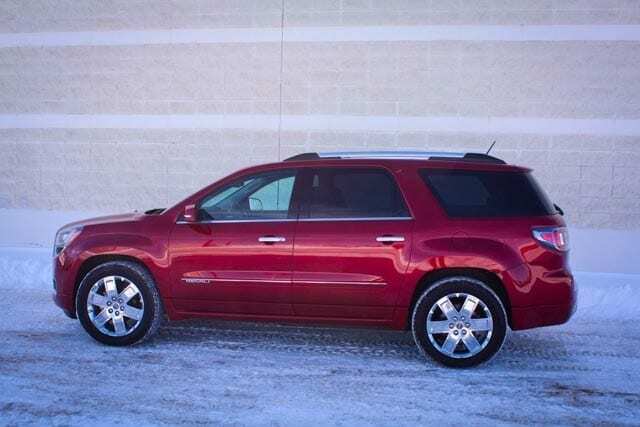 The Acadia is GMC’s edition of the non-identical triplet GM SUVs. The others are Chevrolet’s Traverse and Buick’s Enclave, and the Acadia slots in between them in terms of price and cachet. 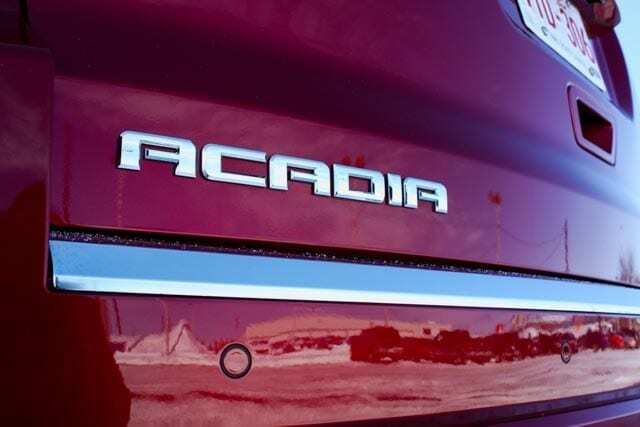 The Acadia’s styling has been updated slightly, but remains aligned to the original. 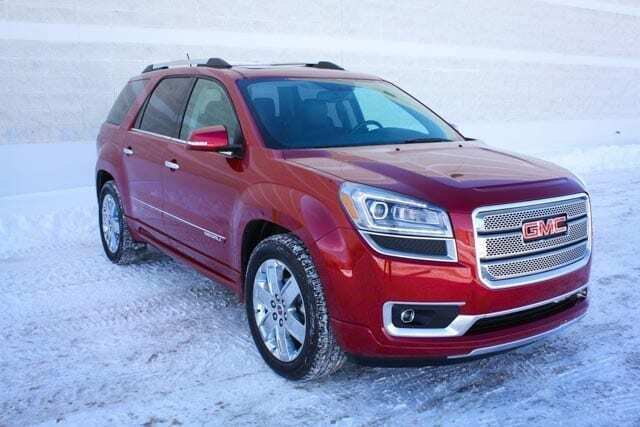 I’ve always felt the Acadia was the most handsome of the triplets. 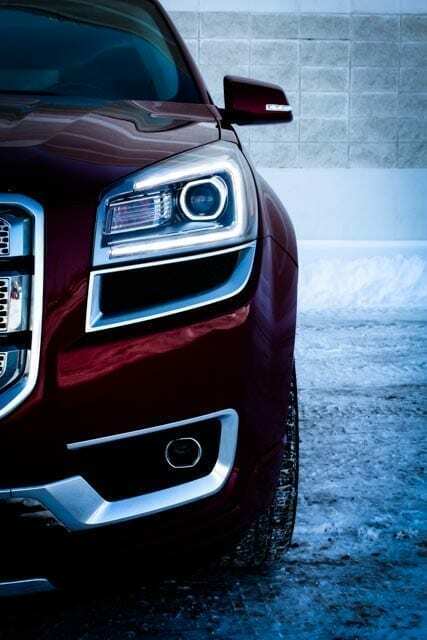 The Denali trim steps it up a notch too. It’s a pretty chunky SUV with substantial front and rear overhangs. 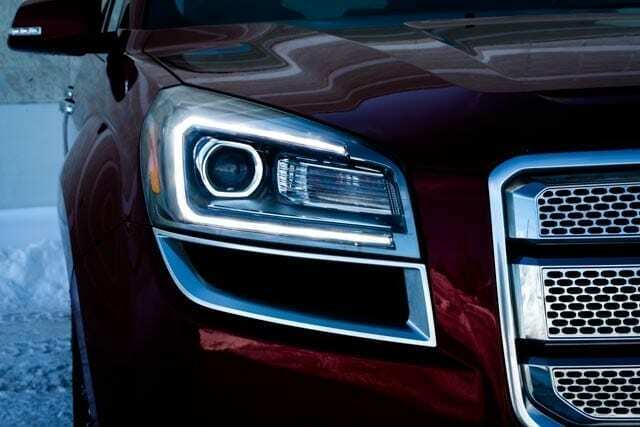 The grille, headlights and foglights are all integrated cleanly. 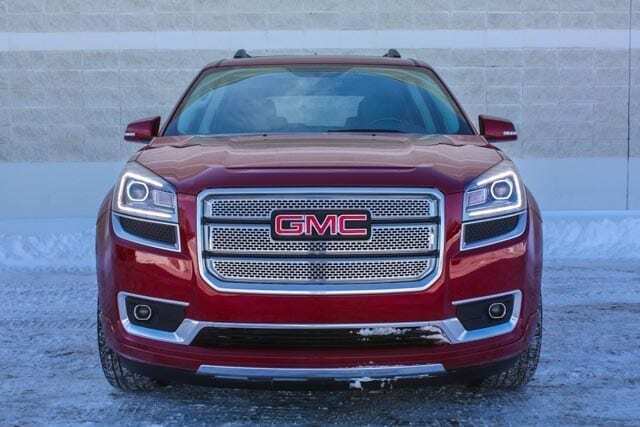 That Denali grille doesn’t look like it’s messing around, and the cool bracketed LED running lights got a lot of second looks. The rear side glass gets the wrap-around look, a la Ford Explorer. The fenders flare out a bit, and there are new integrated exhaust tips that blend into the rear end. 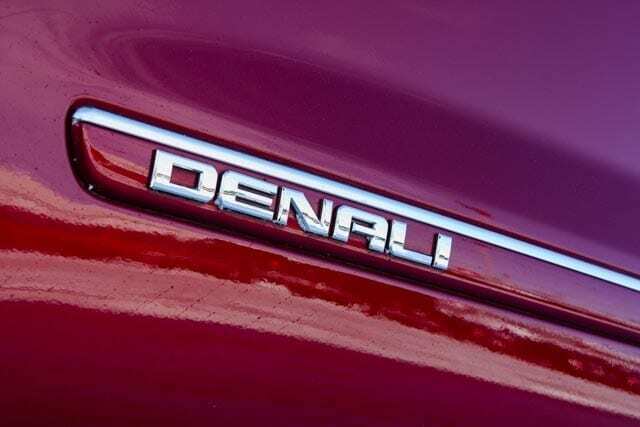 There’s plenty of chrome, especially on the front and rear ends, to remind you that this is a Denali. For the most part, it’s done in a classy way, although the bottom of the tail gets a bit blingy for my taste. 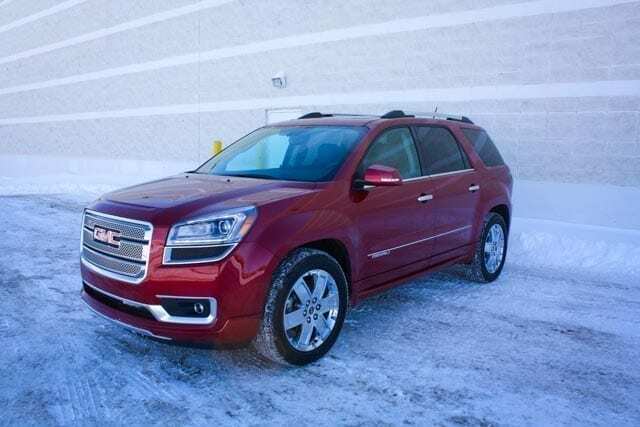 It’s a good-looking SUV, but it is a bulky one. A final note – the Crystal Red tintcoat looks spectacular and simply glows when it’s clean. A number of people commented very positively on this color, and I quite liked it too. 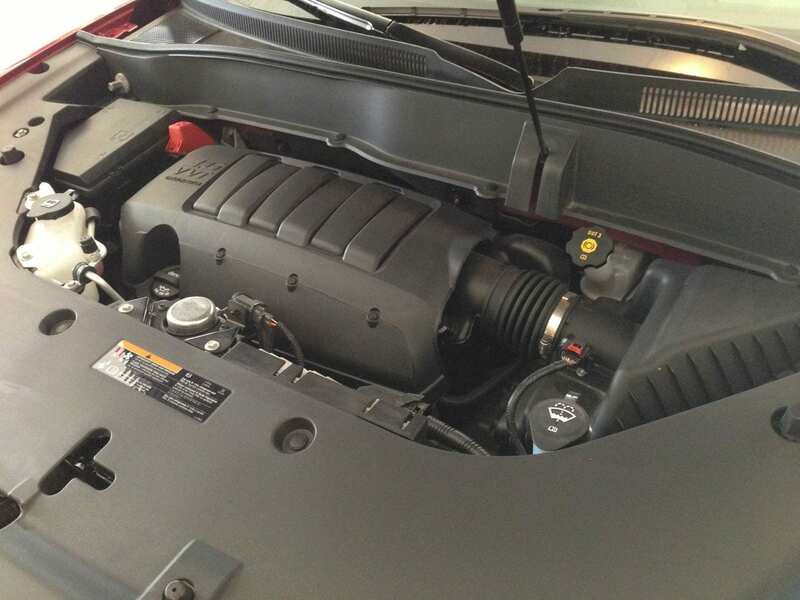 GM’s 3.6-litre direct-injection V6 puts out 288 horsepower at a soaring 6300 RPM. Thankfully the torque that we’re after in North America (270 lb.ft of it) is accessible at 3400 RPM. The fuel economy is rated at 13 L/100 km in the city and 8.6 L/100 km on the highway. Sadly, my average for the week came in at 15 L/100 km. This combined some city driving, much of it through slush and heavy, fresh snow and so it shouldn’t be that surprising for this class of vehicle. The unfortunate thing is it also included a road trip to Calgary with our family. I actually made an effort to drive economically, which I usually don’t do. I wonder what I would have averaged if I’d driven normally, which included the occasional heavy foot. The interior is clad in very nice materials – pretty much everything around the cabin is soft-touch plastic, or cushy upholstered and stitched material. All in all, I liked the colours and the contrasting tones were pleasing. The wood trim came across as a bit contrived and fake-looking. The leather seats are very comfortable and nice to look at, but offer basically no bolstering whatsoever. They’re heated and power-adjustable. I found the cabin to be very spacious and at 5’10”, there was plenty of headroom for me. In front of you, you’ll find a decently designed steering wheel, with buttons for cruise control, phone, media and handsfree functions. Behind it are two simple red-lit gauges with a driver information screen between them. It comes with a nasty dot-matrix font display – it works fine, but it’s not nice to look at. 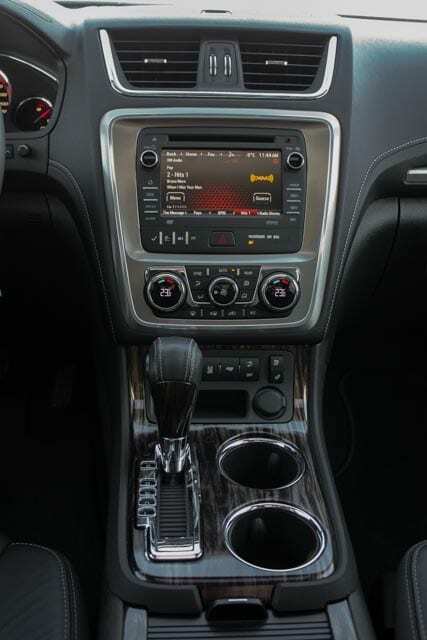 At the top of the center stack sits a touchscreen handling media, phone and vehicle setting functions. It’s not the most intuitive system, but it works fine. I’m starting to prefer a more simplistic approach that I’ve seen in something like the Chevy Trax. Below the screen is the tri-zone automatic climate control system. Dual-zone up front, and controls for the rear zone. Nice! At the bottom of the stack is a 12V plug and a storage slot – sadly, it’s basically useless because it’s only about an inch and a half deep. The center console is home to the shift lever and two cupholders. Behind that is a scrolling cover – slide it back and you’ll find two organizer trays and below them, a carpeted bin with another 12V plug. Finally, there’s a sliding armrest with a shallow storage tray under the lid. Overhead, you’ll find a 3 position HomeLink garage door openers and a lovely dual sunroof – the front one tilts and slides and both have manually retractable sunshades. I really liked the heads-up display in the Acadia. It’s adjustable for brightness and height on your windshield, and allows you to toggle what it displays. 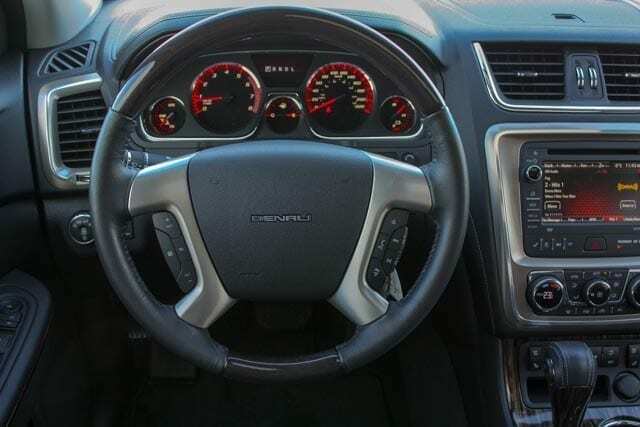 You can see a digital speedometer, a speedo and a digital tachometer, or what’s playing on your media system. This model also has a blind-spot monitoring system, which shows up as an orange symbol that will glow in your side-view mirror when someone is in your blind-spot. Even if they’re a couple of lanes over. 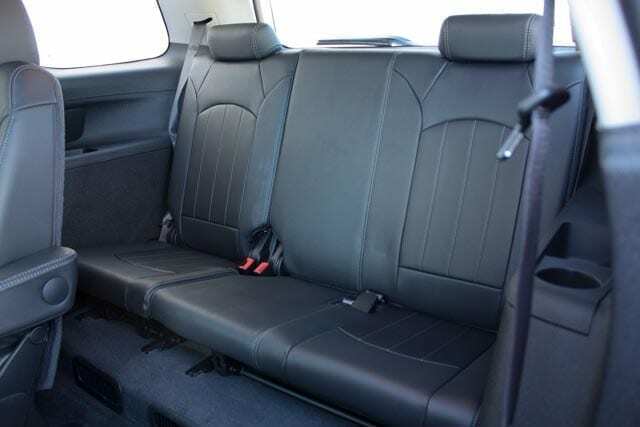 The second row has two bucket seats – they are very comfortable, and are adjustable fore and aft, and recline as well. I appreciated the center armrests that can flip up and out of the way. There is ample head and leg room in the second row, and it feels even more spacious because of the light from the second sunroof above. The seats have enough space between them for someone to get to the third row. Alternatively, they slide and fold forward easily to make third row access even better. We also found the space between the seats useful for significantly more stuff during road trips. There’s plenty of comfort and convenience here too – there’s a rear climate control panel at back of the center console (feeding excellent ceiling-ducted vents for both rear rows – like a minivan), a separate audio system controls and two headphone plugs, a 12V and a 120V household plug, and a ceiling-mounted DVD-based rear entertainment system. A couple of seatback map pockets, decent door bins and a convenient cupholder in the door’s armrest all help put things in their place. Each of the second row seats has a LATCH anchor for kids’ seats and the doors open wide for easy access. The third row has three seats, three seatbelts and headrests for the two outboard positions. 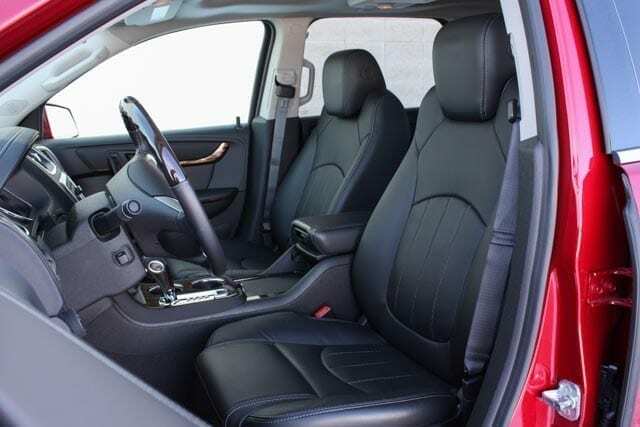 Although the seats are thinner and somewhat harded, they actually remain pretty comfortable. Surprisingly, I had enough headroom back there too. 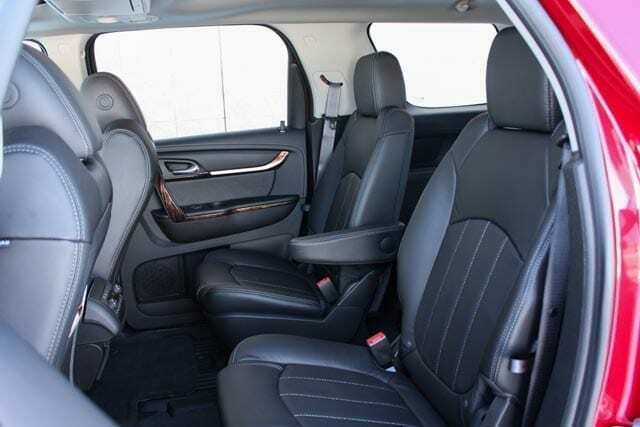 Legroom is at a premium, but adults could fit back there which is both impressive and unusual. The biggest space issue was the room for feet, which is limited because of the second row seat tracks. Even third row passengers are blessed with cupholders, storage bins on each side and separate reading lights. Main cabin storage consists of a lidded bin on the dash, containing the USB plug, somewhat useless front door bins and a large glove compartment. 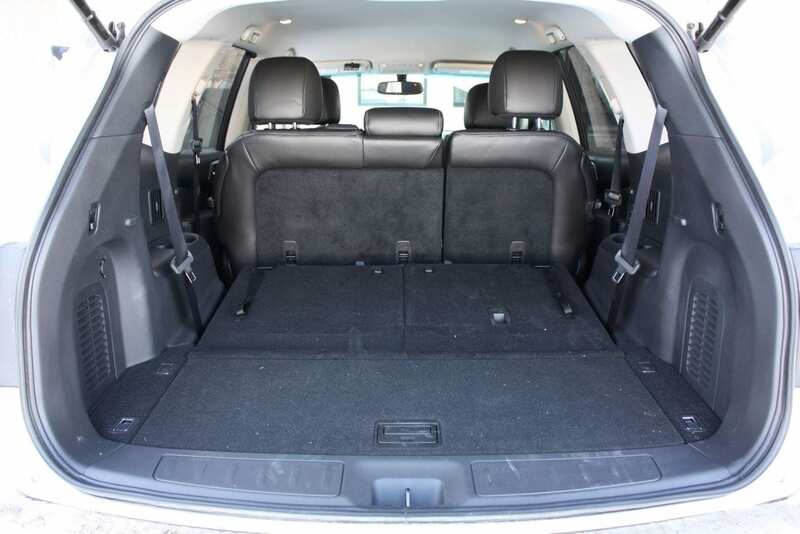 The trunk space has quite usable room even when the third row is in use – 691 litres. 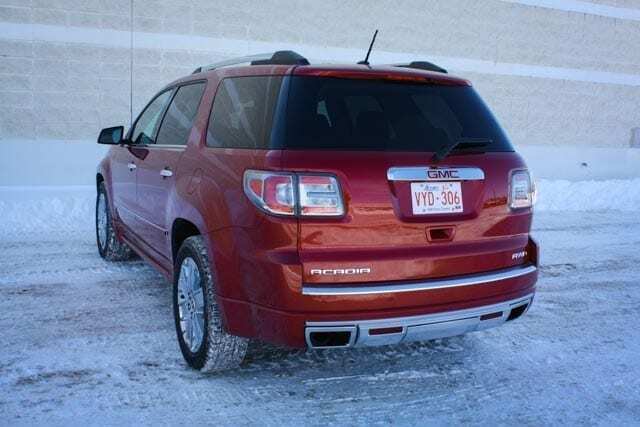 We took the Acadia on a short road trip to Calgary and back with three adults and three kids and were fine. There are great tie-downs, a 12V plug and a significant storage compartment (which is the full width of the trunk) under the floor. Of course, the third row folds flat (in a 60/40 split) to make an almost ridiculous 1991 litre cargo space. There’s a power liftgate – you can open it from the dash, your key fob and from inside or outside the trunk lid. I found something here in the Acadia that I haven’t seen in any other vehicle to date. Rear audio controls. Nope, not the ones that are at the back of the center console that you can control from the second row. No, these ones are in the trunk! They allow you to choose your music source, change tracks or stations and control the volume. Sprechen Sie tailgate party?! Not sure I’d ever use this function, but football fans or campers would love it! The Acadia does the driving thing well. Considering its great mass (well over 4800 pounds), the handling is very secure and competent and it feels less top-heavy than some other large SUVs. It has a great ride in the city and on the highway. It felt very torquey off the off the line – GMC got the low-end gearing and throttle response right here. Is it a fast vehicle? Not particularly, no – but it never feels slow around town. Even on the highway, once it shifts into the correct gear for passing, it does a good job moving its bulk in the right direction. I also appreciated that it was a quiet ride – road, wind and drivetrain noise was controlled very well in all situations. The transmission is smooth, and for the most part, does its job imperceptibly. You can shift it manually, using a thumb toggle on the gear selector. I hate these manual shifting systems, and on vehicles like this, it tends to make more sense to allow the slushbox to do its own job. 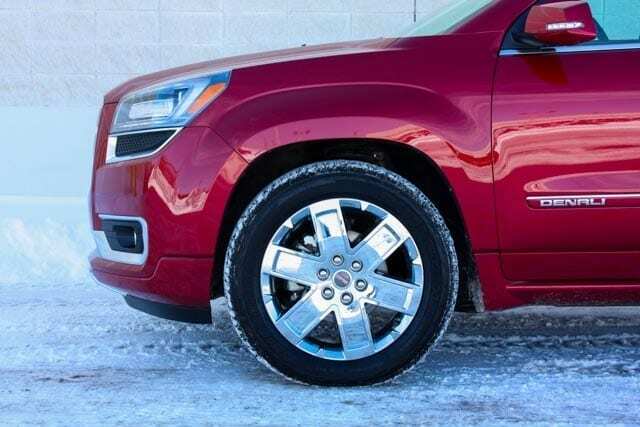 The Acadia is a front-wheel drive based vehicle, and you can tell when you’re in the snow – it plows a bit before the rear tires get some torque. Of course, for most driving, it does a great job, but if you’re trying to have some fun in the white stuff, it’ll always start with plenty of understeer. That’s not a knock on the vehicle, and to be expected in this class. I found the brakes to be powerful enough effective, and the visibility out of the vehicle is decent. The view out of the back is a bit constricted and it’s further hampered by the headrests. 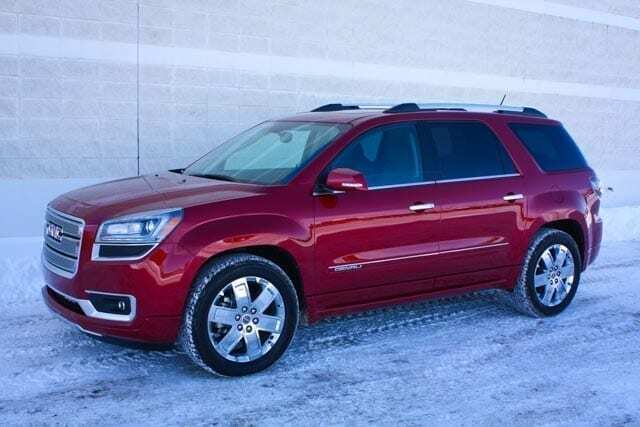 Although the Acadia comes in at a significantly higher price than some of the three-row large cross-over competition (like say the Nissan Pathfinder or the Toyota Highlander), the similarly-equipped Chevy Traverse’s price (which would be a more base model like the 2LT) would be closer. Neither of the competitive base models has a sunroof or a rear-seat entertainment system. Personally, I’d never consider the latter – buy each kid an iPad mini and they’ll be happier, you’ll get much more utility out of them and save money. WAF (Wife Acceptance Factor) was exceptionally high. She absolutely loved it. She said it felt very secure on the road, especially around corners, and she enjoyed the driving position. She also felt that everything inside made sense to her, except that they put the rear wiper controls on the dash – I’d have to agree with her there. Overall, the Acadia really impressed me. It felt very well built. 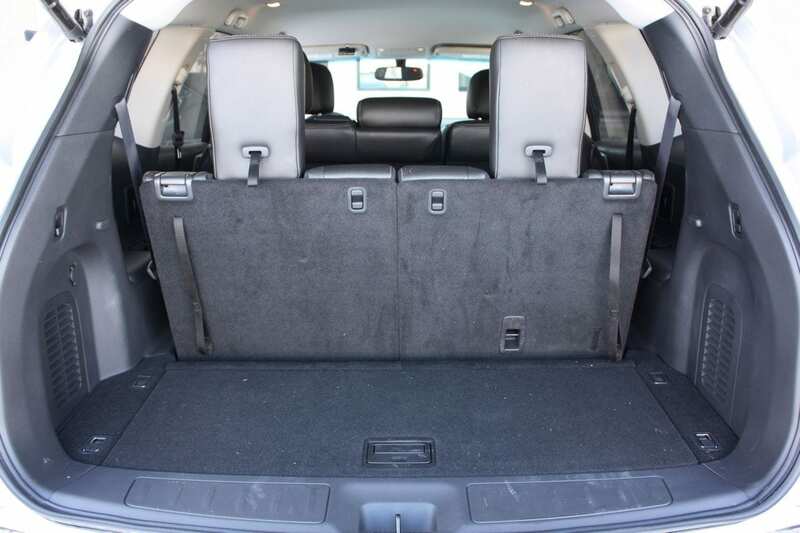 The materials and appointments inside are nice, and the details are thoughtful especially when you compare it to an aging vehicle like a Toyota Highlander. The vehicle works well, especially for larger families that would need the space in the city on a daily basis, and also need to stretch their legs on the highway occasionally. I found it did a good job of getting us around, moving the way we wanted it to, looking decent and consistently surprising us with well thought out touches. The Acadia is a vehicle I would happily own. The only thing that would give me pause would be the fuel economy and the slightly elevated price versus the competition. 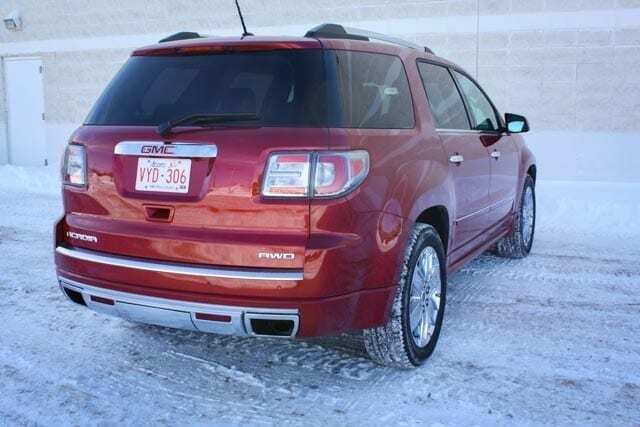 Disclosure: Vehicle was provided by GMC Canada.